KATHMANDU, Nov 18: Hundreds of child rights activists and students marched in Kathmandu on Saturday demanding an end to child marriage and implementation of child rights as enshrined in the constitution. The participants assembled at Bhrikutimandap and rallied to Bhadrakali-Sahidgate before merging into corner meeting at Ratnapark to mark the International Child Rights Day. At the function, actress Rekha Thapa, who is recently campaigning against child marriage urged the stakeholders to end the malpractice saying it has largely affected the socio-economic status of women. “How can we achieve economic prosperity when more than half of the total population is deprived of socio economic rights,” said actress Thapa. Krishna Gautam, senior vice-president of NGO Federation of Nepal, said child marriages have caused multiple social problems such as divorce, economic deprivation and social disputes. “Many social problems have emerged in the society because of child marriage. So, it's our common responsibility to eliminate it,” said Gautam. The rally was organized by the Karnali Integrated Rural Development and Research Centre (KIRDARC) Nepal in collaboration with Good Neighbours International (GNI) and various child rights clubs. The organizations are holding a series of programs under the theme of promoting child rights and eliminating child marriage. 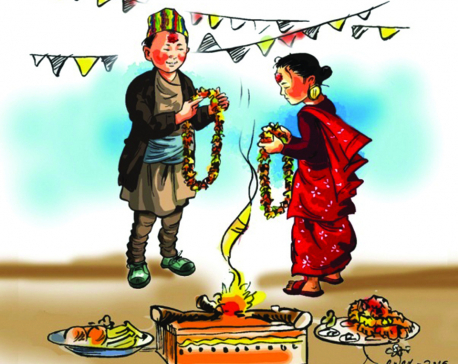 Child marriage is illegal in Nepal but the practice is still prevalent in society. Nepal has the third highest rate of child marriage in Asia, after Bangladesh and India. Meanwhile, Police on Saturday arrested Prabin Silwal from the rally. Child right activist Silwal, according to police, was arrested on charge of attempting to disrupt the rally. Silwal has been advocating to stop organizing rallies, interactions and discussion programs on child rights saying they have failed to achieve any results in the recent years. Last month, he had torn down copies of a draft bill on child rights-2018 disrupting a program jointly organized by the government and various development partners including a UN agency in Kathmandu.